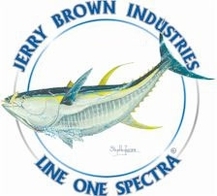 Based in Gold Hill, Ore., Jerry Brown Industries has been raising the bar in fishing line with its Line One Spectra spliceable, hollow and standard braid solid lines. Used by big-game anglers worldwide, Jerry Brown hollow core fishing line lets you splice Spectra to Spectra or Spectra to monofilament, meaning that you don�t have to worry about the loss of line strength or bulkiness that often results from knots. Silky smooth and strong, Jerry Brown line is available from TackleDirect in several colors as well as multicolor spools colored in 10-yard increments that let you know how much line you�ve let out that is perfect for jigging and trolling. We also offer Jerry Brown needle splicing kits that let you splice mono from 20 to 300 pounds into their hollowcore Spectra.